A great Oktoberfest or holiday party treat with German flavors. 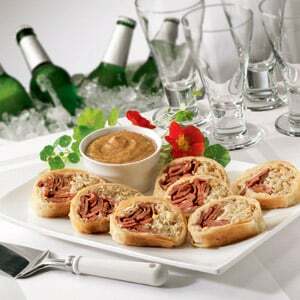 Strudel with apple, sauerkraut and knackwurst or bratwurst, with a sweet mustard cream sauce. Served as an appetizer this recipe makes 8 portions, or 4 portions as an entrée. Served as an appetizer this recipe makes 8 portions, or 4 portions as an entrée.